When you are installing Windows 8 as virtual machine you may get the following Windows-8 error message: HAL_INITIALIZATION_FAILED. Likewise, when you install Windows-8 with "VMware Player" and during installation of Win-8 at "Oracle VM VirtualBox"
you must burn a DVD after the download of Windows 8 and install the "Windows 8" on a real computer. On virtual PC it always comes to any error message. See: Windows-8 on Oracle VM VirtualBox, i got an error message during installation! The virtual PC does not support ACPI. If you want to use Windows 8's touch abilities you will need a screen, that supports multi-touch. I have downloaded Windows 8, just head on to Microsoft's developer site and download it. Instal and HAL_INITIALIZATION_FAILED error message! 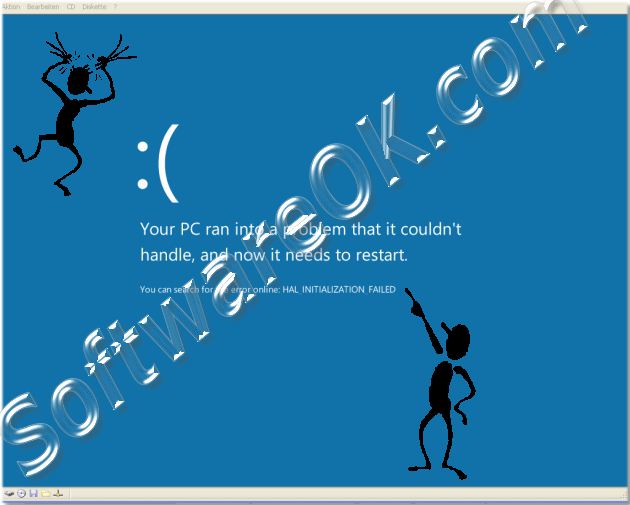 When during installation of Windows 8 HAL_INITIALIZATION_FAILED error message!